(12:15 p.m. BST) -- Cunard Line has brought in Adam D. Tihany as the Creative Director of its next new ship, which is slated to debut in 2022. The hospitality designer will lead all aspects of the as-yet-unnamed-ship's interior design. Cunard has released little details on the new ship -- currently under construction at the Fincantieri shipyard in Italy -- though we do know it will be the largest in the line's fleet, carrying 3,000 passengers and weighing 113,000 gross tonnes. Tihany also works with other Carnival Corporation brands, including luxury line Seabourn, Costa Cruises and Holland America Line, and counts some of the world's most luxurious hospitality brands as clients -- including The Beverly Hills Hotel and Belmond Hotel Cipriani in Venice. In a statement from the line, Tihany said: "Guests can expect a much lighter, contemporary feel, but crucially it will still feel like a Cunard ship and Cunard’s loyal guests will feel very at home. 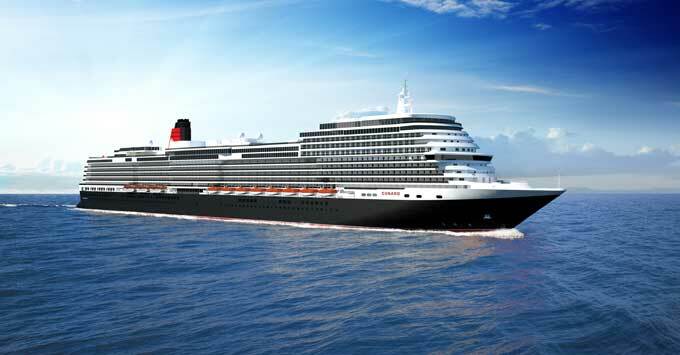 "The new ship will celebrate Cunard’s British heritage but with a whisper, not a shout. Everything a guest expects to see on a Cunard ship will be there, but in a different way to the other three." Cunard's senior vice president, Simon Palethorpe, said: "We are immensely excited about Adam’s appointment. Cunard offers unrivalled luxury ocean experiences and to have such a renowned designer as the Creative Director for the new ship shows our commitment to providing our guests with a whole new experience. "Adam is working with a great team and there are some stunning ideas and concepts in the making, but still with the unique Cunard luxury and distinctiveness that our guests know and love. We look forward to sharing more of our designs next year as they come to life." Cunard is currently two thirds through a fleetwide upgrade programme that began in 2016 with $132 million spent on Queen Mary 2. This was followed with $40 million spent on Queen Victoria in 2017 and Queen Elizabeth will undergo a similar refurb in November 2018.